Solder the XBee RF Module to the PCB breakout board as shown. The white silkscreened lettering should face downward, away from the XBee Module. 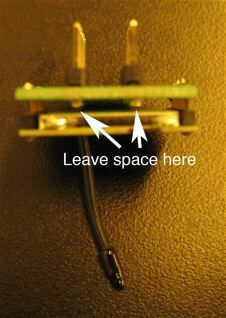 Be sure to leave enough space so that the headers do not touch the back of the module. XBee and the metal headers so that they don't touch and short out. Set up two breadboards with a PIC on each. You'll need to add a 3.3 Volt regulator to each board, for powering the XBee radios. The 3.3V regulator used in this example is arranged (from left to right) Ground-Output-Input, which is different from the 5 Volt one. PIC18F452 running on 5 Volts. 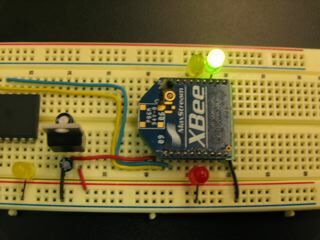 XBee running on 3.3 Volt regulator at center of breadboard. Connect 3.3 Volt power to pin 1 of the XBee, ground to pin 10, RC7 from the PIC to pin 2 and RC6 to pin 3 as shown. You may also want to add LEDs to pins 6, 13 and 15 for some status feedback. 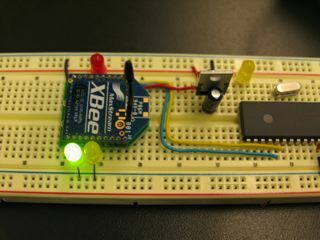 XBee connected to 3.3 Volt power and common ground. 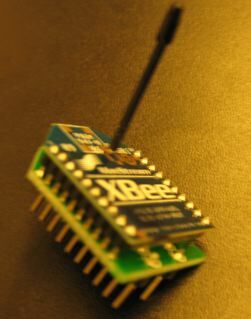 The XBee tx pin is connected to rx on PIC, and XBee rx pin is connected to tx on PIC. in AT command mode, and red LED lights when receiving RF data from another XBee radio. 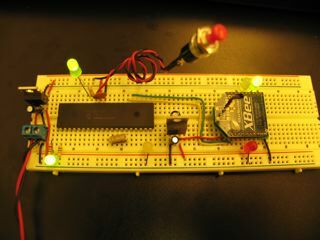 Attach a switch to RB0 of the sending board, and an LED to RB1 of the receiving board. Close the switch and the LED should light up. Change your code so that there's a switch and light on both boards, and closing either switch lights the light on the other board. This should help familiarize you with how the radios communicate. There's PLENTY more features on the XBee including broadcast modes, data enveloping and mesh networking. Once you're comfortable with the basics, you may want to explore further.